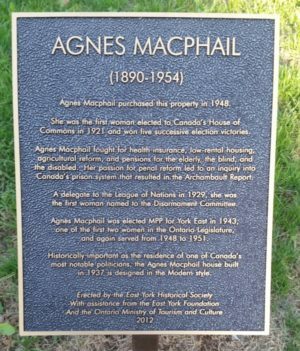 In the October issue of Leaside Life, “Where in Leaside,” we showed part of the plaque marking the location of the Agnes Macphail House. The property at 720 Millwood Road (also known as 2 Donegall Drive) received a heritage designation in 2012. 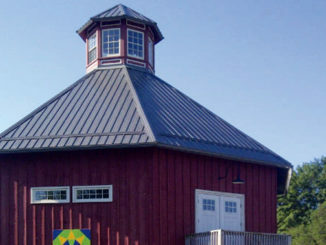 As stated on the City of Toronto website: the property is worthy of designation under Part IV, Section 29 of the Ontario Heritage Act for its cultural heritage value, and meets the criteria prescribed by the provincial government for municipal designation under the three categories of design, associative and contextual values. Located on the northwest corner of Millwood Road and Donegall Drive in Leaside, the Agnes Macphail (note spelling) House (1937) is a two-storey duplex. The property at 720 Millwood Road has design value as a rare example of Modern styling applied to a duplex in Leaside that was designed to take advantage of the corner setting with entrances on two streets. The Agnes Macphail Houses displays the flat roof, angular shape and geometrical openings associated with 20th century Modernism, while retaining the modest classical detailing derived from the Georgian Revival style that is displayed on much of the residential housing in Leaside. Contextually, the Agnes Macphail House is important in supporting and maintaining the character of Leaside in the residential area of the community east of Bayview Avenue where it also is physically, functionally, historically and visually related to its surroundings. 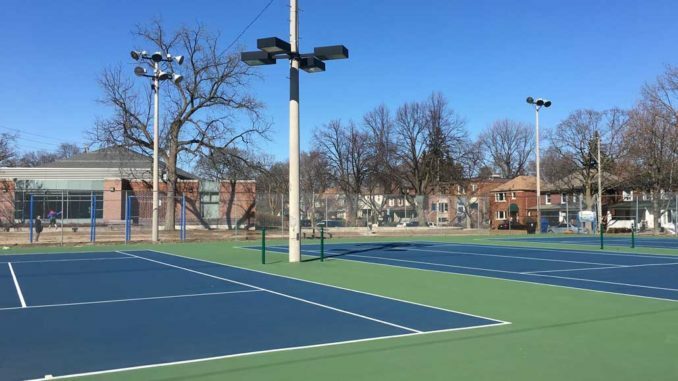 Located on a corner lot in the first block south of Bayview Avenue, the duplex addresses two streets that feature the mixture of low-rise detached, semi-detached and apartment housing identified with the residential sector of Leaside. The duplex is historically associated with the notable Canadian politician, Agnes Macphail, who owned and occupied the premises from 1948 until her death in 1954, a period when she remained actively involved in politics. The first woman elected to Canada’s House of Commons in 1921 where she served for two decades, Macphail championed labour and farm issues, including equality for women and prison reform. Entering provincial politics, Agnes Macphail was one of the first two women elected to the Ontario Legislature where she represented York East from 1943-45 and 1948-51. She was responsible for Ontario’s first equal pay legislation in 1951. 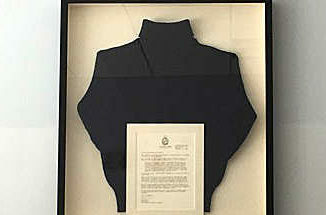 Also in honour of her important role in Canadian history, the Agnes Macphail Award, established in 1994 is awarded each year on March 24th, the anniversary of her birth. The annual award recognizes an outstanding community minded, civic volunteer. Among those previously honoured are several current contributors to Leaside Life magazine, including Ruth Goldhar (1997), Lorna Krawchuk (2007), Geoff Kettel (2008) & Alan Redway (2013). Most recently, the 2016 recipient was local real estate broker Patrick Rocca.